Feathers with Essie Warm & Toasty Turtleneck and mail from Adenina - Polish This! Adenina restocked and also got some new water decals recently and I got some of them to try out, so of course I had to do a manicure with them immediately. I've also wanted to use Essie Warm & Toasty Turtleneck for a manicure after swatching it as the color is so gorgeous, so I decided to do those both in the same mani. I used two coats of Essie Warm & Toasty Turtleneck, then I placed one decal on every nail and finally I dapped on really lightly just a hint of Essie Sparkle On Top on top of the decals just to make those feathers sparkle a bit. I think these feather decals are really perfect as they are so fluffy and delicate looking. They were also really easy to use and apply, so no complaints there! I haven't yet had the courage to try to paint any kind of feathers on my nails myself, so these are really easy way that you can use to achieve that similar look. I'm still in love with Warm & Toasty Turtleneck too, it is really an awesome polish! To color is really gorgeous and it applies like a dream. You only need two easy coats and that's it! If you don't have this one already, you should really get it! 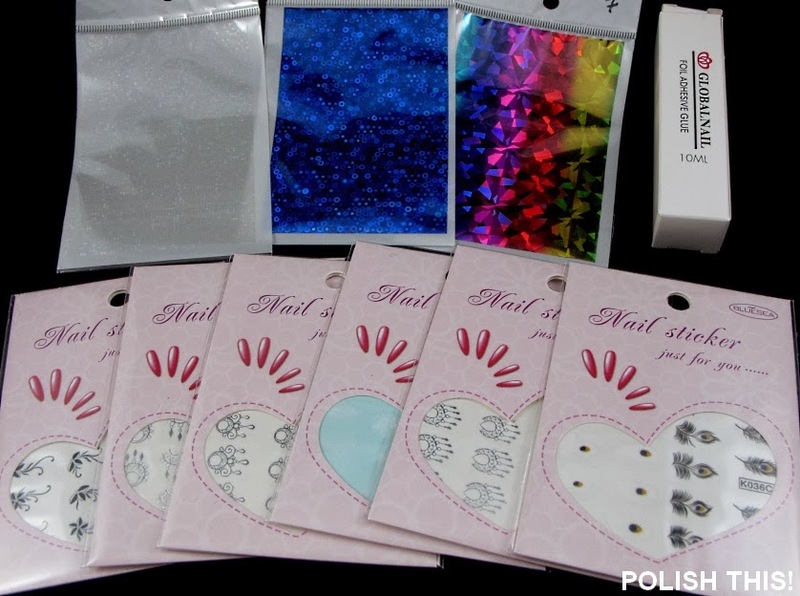 They provided me with a 10€ discount code, so I ordered some of those new water decals and I also wanted to give some of the foils a try, so I took three of those and a foil glue. The decals are Y007, C072, C069, K036, C066 and K036C. The foil sheets are numbers 4, 1 and 7. Of course the ten euros didn't cover this all, so I ended up paying some of these myself, but I really wanted them all! Don't forget to participate in my Essie giveaway where you can win this gorgeous Warm & Toasty Turtleneck and all the other five polishes from Essie's winter collection! *I have gotten the Adenina products and Essie Warm & Toasty Turleneck for review. For more information see my disclosure policy. Tilauksen mukana tulleet ihanan pörröisen näköiset höyhensiirtokuvat piti saada hetimiten kynsille ja myös Essien Warm & Toasty Turtleneck on odottanut pääsyään mukaan kunnolliseen manikyyriin, joten päätin luonnollisesti sitten yhdistää nämä kaksi. Pieneksi lisäksi töpöttelin vielä Essien Sparkle On Topia höyhenien päälle, jotta ne säihkyisivät hieman. Manikyyristä tuli ihanan hempeä ja täytyy kyllä sanoa, että tykkään tuosta Warm & Toasty Turtleneckistä edelleen ihan hulluna. Se on todella upean sävyinen ja ihan super helppo levitettävä. Myös nuo siirtokuvat olivat todella hyväkäytöksisiä, joten ne asettuivat kohdilleen ilman minkäänlaisia ongelmia. Muistakaahan käydä myös osallistumassa Essie-arvontaani, jossa voitte voittaa itsellenne tämän ihanaisen Wam & Toasty Turtleneckin ja kaikki muut viisi Essien talvikokoelman lakkaa! *Adeninasta saadut tuotteet ja Essien Warm & Toasty Turtleneck on saatu arvioitaviksi. love love love this!!!!! awesome decals!! OMG!!! This is so pretty. I super love the color and the design. You def made the right decision on making this kind of mani. Love it! Tämä lakka täytyy kyllä jossain vaiheessa itsellekkin kotiuttaa! Niin monessa blogissa olen sitä ihaillut :) Ihanat kynnet! Aivan ihanat :) Tämän Essien kokoelman kaikki sävyt kolahtaa kyllä ja lujaa! Oi, ihan mahtavaa, että nää sai sut runolliseksi! :)) Kiitos! Voi vitsi, miun on kyllä varmaan pakko hankkia toi lakka...tuo on niin hyvän värinen..! Beautiful! 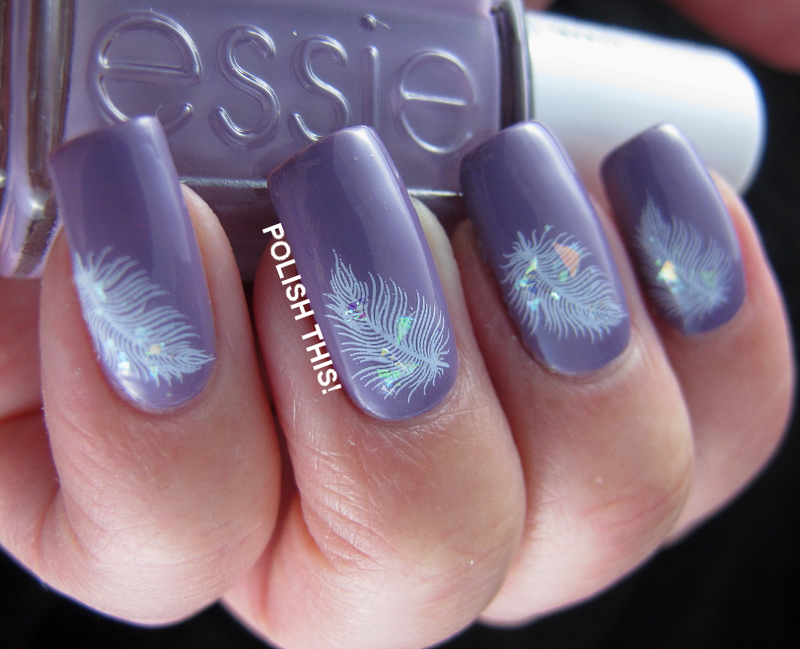 I really love this mani, it looks so elegant with those feathers (and the colour is just perfect).